6Heads have been really lucky this week. We were treated to a strategy session on purpose by Norman Pickavance and Charles Wookey from the Blueprint for Better Business. There is another blog on the way to you from what came out of that evening and we are very excited about that too. In the sustainability world many of us wear different ‘hats’ and I am doubly lucky because the hat I wear daily is the one I wear to work with Norman at Grant Thornton where we are embarking upon a journey of Shared Enterprise, through the vision of our newly elected CEO Sacha Romanovitch. We are thrilled to bits that Norman has written us a guest blog (the first of a series we hope), in the spirit of shared enterprise, so that you can all come on this journey with us. Sounds, smells, tastes. They can all on occasion bring back powerful memories. Back in the late 1980s new ideas on how business should be run emerged as companies struggled to compete with nimbler and cheaper operating models arriving from Asia. I was in the early part of my career and had been chosen to lead a project to uncover emerging best practice in manufacturing. There was no Google search, so you had to actually go and visit places in those days if you wanted to really know what was going on. One factory I reviewed still stands out in my mind. 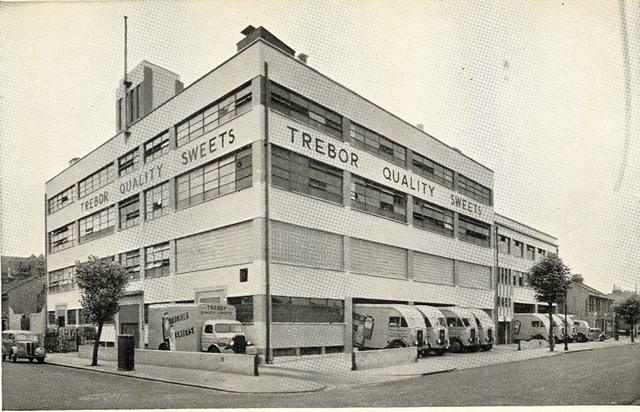 A Trebor mints operation somewhere near Colchester. At one end of the factory stood what looked like a huge chemistry set with tubes and pipes, vast storage vessels and hoppers. You could smell the mint everywhere. However most of the factory floor was filled with lines where the mints were collated into rolls, went through conveyors, and were wrapped and then packed into boxes. The packing lines were staffed by what seemed like hundreds of people, all dressed from head to toe in special coats hats and shoes. There were no managers, anywhere to be seen. The place seemed to be running itself. “Not having a manager isn’t unusual, you shouldn’t think of it like that. At home I run the house, I make sure the kids are fed and educated, I run the budget, I plan the holidays, I take care of everything. Why then when I come to work here, would you assume that I can’t do things myself or make decisions. That’s all we’re doing. We’re just running our lives, just like we do at home…we run the shift patterns, and check the line’s productivity and quality and we do the hiring and we run our holiday rotas, so of course we decide who goes on breaks. Why would we need a manager to do those things when we can do it all ourselves”. That conversation in the middle of the packing hall at the Trebor Mints factory has stayed with me for over 25 years, and in a way it reflects my outlook on the way all work should be. Yet in the intervening period these ideas have languished and new models have not been more widely adopted. If anything many work environments have gone the other way. If we now fast forward to early 2014. 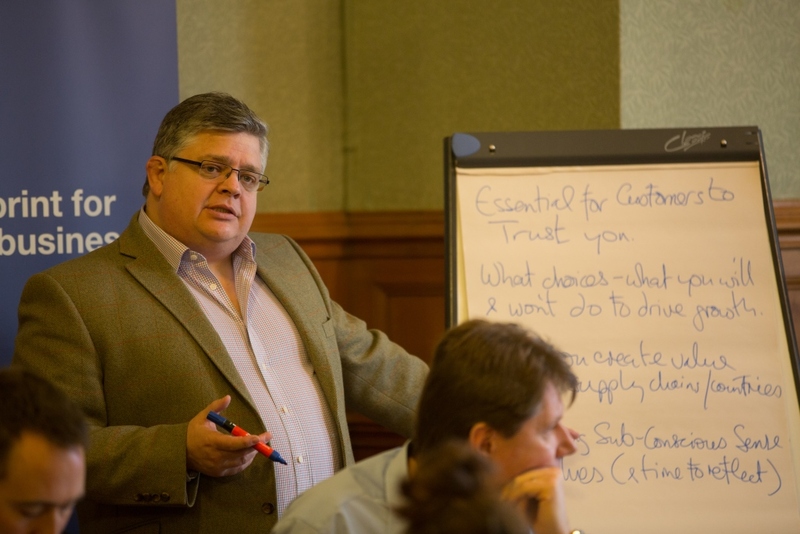 I am co-facilitating a seminar at Oxford University for senior executives from organisations like Anglo American, Legal and General, and Old Mutual. It’s part of the work Blueprint for Better Business are doing, to rebuild trust between business and society. We spend our time exploring how deeper respect for human dignity is central to enabling each person to make their fullest contribution both in society at large and in the workplace in particular. The group debates just how deeply rooted these ideas are in the human psyche and how they are the bedrock of building successful and sustaining relationships, be they personal, businesses or in communities. For many it opens up fresh perspectives on the world, and reminds me of what is important. But will these great ideas really be implemented? Roll forward now to April 2015. I’m in a meeting at Grant Thornton we are discussing how we create a spirit of shared enterprise across 5,000 people, to unlock the potential for growth in the firm, and to make a bigger contribution to the world around us. We decide that we are going to go for it, but that before we do, we have to ask the partners in the firm to vote to share their rewards in the firm. The aim we say is to create an environment in which everyone’s ideas will be valued , in which every person will have a sense of shared responsibility, where everyone will be able to make their own decisions and where everyone will have a share in the rewards of our joint endeavours. We decide to put it to a vote. All the partners come together in a vast hall in the center of London. Electronic key pads in hand. They are asked to make their selection. A giant electronic scoreboard hangs above us. I wonder about the wisdom of taking such a public vote and then the score comes up. 99% of partners have voted in favour of becoming a Shared Enterprise. I feel elated, and mixture of joy and relief wash over the leadership team. But then the hard bit starts – how do you actually do this in practice? A small group have been working on the implementation plan for a month. However when put to the wider leadership team there is a feeling that maybe the ideas are almost too radical,and not tested enough. The natural caution of experienced accountants perhaps understandably want greater assurance that it will all work. We agree that we will learn by doing and we will keep talking and testing the thinking as we go. Everyone is on edge. People are nervous, senior leaders are nervous. Even academics like Professor Hamish Scott from Ashridge , and specialists in ideas generation Rowland Harwood from 100%Open, wonder whether we need more time to refine our plans. Their nerves impact me, then our CEO Sacha say’s confidently that it will all be fine and that we have to treat our journey to becoming a true shared enterprise as an experiment. “Don’t some experiments go wrong” whispers someone. The key I say is that we have to explain to everyone what we are doing, that we are experimenting and that they are part of the process, every step of the way. That we will be completely transparent about what’s working and what’s not, fix things quickly and continue to learn. We aren’t starting small though, we are starting big. Not only that we are taking on a big theme about how we should develop the firms strategy. Somehow despite our trepidation we decide that we will make a start on the 9th July at a pilot site near Gatwick. If this and four other pilots are successful throughout July we will then involve everyone. We agree that the aim is to run lots of sessions with people around the country, collecting everyone’s ideas both in person and on line and feeding back frequently on the big shared themes that are emerging. The jargon calls it crowdsourcing ideas, the skeptic’s still worry it will lead to anarchy. Finally – Heading home… It feels like it’s been a long few weeks. I pop into W.H.Smiths, grab a paper for the journey, and notice the mints at the counter. I take a packet and pay. Finding my seat on the crowded train back to York, I settle back and reflect on the relatively limited number of firms where ideas are really shared and devolved decision making is really happening. A few stand out precisely because they are exceptional. Places like technical products group Gore-Tex and food producer Morning Star have made shared employee responsibility part of their point of difference. I wonder to myself whether people with a number crunching background are cut out for this kind of thing, whether they are really ready to give up control, and trust their people? The train pulls out. I open the paper and a small article reminds me that Friday July 3rd marks Shared Ownership Day in the UK, a celebration of people power in business. I smile. Maybe Grant Thornton can lead the way? 6heads will be gathering at Victoria Embankment Gardens for a relaxed evening of excellent conversation, laughter and inspiration on 29th July at 6.30pm. Looking forward to catching up with your adventures in sustainability.